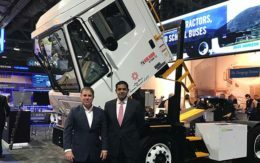 Fiat Chrysler Automobiles sees a system that generates electricity to reduce the load on a gasoline engine as the first step on its road to electrified trucks. The automaker’s largest electrification project is a 48-volt mild-hybrid system called eTorque that debuts on the flagship Ram 1500 full-size pickup truck, one of the top selling vehicles in the U.S. auto market. The system uses a motor generator unit attached to the engine. 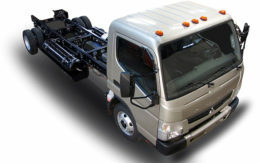 It sends power to a lithium-ion nickel manganese cobalt-graphite battery pack mounted in the rear of the cab. The pack consists of 12 battery cells in two side-by-side stacks. The larger battery provides the traditional 12-volt auto battery with more than enough electricity to handled increased demands, reducing the load on the gas engine. Power steering, anti-lock brakes, power windows, air conditioning, large touchscreens and other functions can run smoothly without sapping that power from an overworked alternator, which is no longer necessary. It’s different than the hybrid systems on vehicles such as the Toyota Prius or Honda Insight, which are stronger and can run the car on electricity for short distances. The Ram is the first mass effort by a major manufacturer to sell electrified pickup trucks. 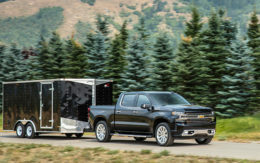 General Motors briefly offered hybrid versions of its Chevrolet Silverado and GMC Sierra in limited numbers. Ford will build a plug-in hybrid F-150 by 2020, but expected volume is unclear. Rather than do a gradual rollout, eTorque will be featured prominently right away. The system is available across all trims, standard on V6 engines and optional on the 5.7-liter Hemi V8. It comes as truck sales are red hot. FCA sold more than 500,000 Ram trucks in 2017, making it the third best-selling vehicle in the U.S., according to industry research firm Autodata Corp.
“It demonstrates that it’s a doable technology in all vehicles, not just small little cars,” said Dahlia Garas, director of the Plug-in Hybrid & Electric Vehicle Research Center at the University of California, Davis. The eTorque technology is also available on a popular SUV, the new Jeep Wrangler JL. FCA sold more than 170,000 Wranglers in 2017. The vehicles have better fuel economy figures than non-eTorque versions. Engines with eTorque cost an extra $1,000 on the Wrangler and $1,450 on the V8-powered Ram. The move makes FCA the largest player in electrified light trucks. But as automakers update their fleets to align with shifting fuel economy standards there could be more on the horizon, said Sam Abuelsamid, senior analyst with Navigant Research. Other trucks and SUVs that could feature mild-hybrid systems include the next Nissan Titan, upcoming Ford Ranger and some models from Ford and General Motors, he said. The eTorque system shows that mild hybrids have more to offer than just efficiency. Vehicles equipped with eTorque can activate their engine start-stop mode under idle more often and for longer periods of time. The engine starts again with less of the annoying shudder that causes many drivers to turn similar systems off. At a 90-second stoplight the Ram V8 with eTorque saves 1.7 ounces of fuel, according to FCA. Since the entire system weighs about 100 pounds and the compact batteries fit in dead space behind the rear seats, there is no sacrifice in maximum payload or towing capacity. Other automakers are beginning to dabble in mild hybrids. The Kia Sportage and Mercedes-Benz GLE also have the technology. Ford introduced a mild-hybrid version of its Transit commercial van at the 2018 IAA Commercial Vehicles Show in Hanover, Germany. Suppliers are also building mild-hybrid systems that manufacturers can build into just about any new model. Robert Bosch, Delphi Technologies and Valeo produce a mild-hybrid system for manufacturers to order. FCA called on supplier knowledge to assist with eTorque. The motor generator unit is made by Magneti Marelli on the Ram’s Hemi V8. Continental makes the unit on the V6 and the Wrangler’s turbocharged four cylinder. The batteries in the Ram are provided by LG Chem. In the Wrangler they are provided by Samsung. Equipped with eTorque the V8-powered Ram 1500 can operate in efficient four-cylinder mode under more circumstances. When it is time for the eight-speed automatic transmission to change gears, eTorque can “grab” and slow the engine’s revolutions to ensure a smooth shift. Power gained from slowing the engine is used to charge the 48-volt battery. Both upshifts and downshifts are barely noticeable. The system also uses regenerative braking to charge the battery in all braking situations except a hard emergency stop. When accelerating from a stop, eTorque uses that stored power to turn the wheels their first half-rotation. The system has so many functions that FCA prefers not to call it a mild hybrid. Instead, eTorque falls somewhere between a traditional mild hybrid and the “strong hybrid” system found in its plug-in hybrid Chrysler Pacifica minivan. Editor’s note: photos courtesy of Ram Trucks.